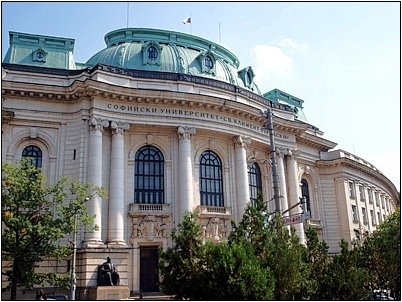 The impressive building of the University of Sofia is situated in the heart of Sofia. Sweden, H E Paul Bejer. The Scandinavian Studies programme is constantly proving its ambitions and potential for evolution as an academic discipline and as a generator of ideas and initiatives, which enrich the multifaceted life in the "St.Kliment Ohridski" University of Sofia - the oldest and most prestigious university in Bulgaria. The Bulgarian specialists in Scandinavian Studies have already established close contacts with universities and scientific centres in the Nordic and other European countries, in the USA, institutions, artistic unions, publishing companies and mass media. The students and the lecturers teaching in the programme travel, exchange both professional and personal experience with their colleagues mainly from the Scandinavian North, and thus contribute to the positive image of Bulgaria, a European country with rich history, turbulent past and dynamic present. A great number of lecturers and students take part in international conferences in the field of Scandinavian studies, publish their own books, translate and serve as mediators of cultural communication between the Bulgarian people and the peoples of the Scandinavian North. Some of the lecturers are honoured with high awards for their contribution as researchers and artists. The curriculum is enriched with courses, which reflect the worldwide tendency towards interdisciplinary approaches combining elements from various fields of culture and science into one common dynamic, modern, indispensable and useful discipline. The efforts of the highly qualified Scandinavian studies lecturers to support other higher and secondary educational institutions in the country in their attempts to keep up various forms of Scandinavian language teaching deserve respect. Since 1999 it has become a regular practice to arrange scientific seminars and conferences in Scandinavian Studies which are held thanks to the practical support and active cooperation on the part of official institutions in the Nordic countries and their embassies in Bulgaria. The seminar on the life and works of August Strindberg (1999), the seminars on contemporary figures, phenomena and tendencies in modern Swedish literature (2000, 2004), the Bulgarian-Danish literature conference (2000), the seminars on the life and works of Knut Hamsun (2001), August Strindberg (2012) and Søren Kierkegaard (2005, 2013), the jubilee international conferences on Snorri Sturlusson and the roots of the Nordic literature (2002), “The Unknown Andersen” conference (2005), the conference celebrating the centenary anniversary of Norway's independence (2005) and the bicentenary anniversary of the Constitution of Norway (2014), the “Ibsen in the time” conference (2006), the seminar on Swedish children’s literature, as well as the conference on the eighteenth century and Northern Europe (2007), on the Scandinavian languages today (2009) and on the fairy tale as a genre and tradition in Northern Europe (2013) proved to be remarkable events in the cultural life of Bulgaria. The papers from almost all conferences are published regularly. The students invariably take active part in arranging these forums, which are an indispensable form of “live” education, a chance to meet and communicate with the most prominent representatives of the science and culture of the Nordic countries such as Tomas Tranströmer, Östen Sjöstrand, Torgny Lindgren, Per Olov Enquist, Jan Myrdal, Lars Lönnroth, Peter Curman, Anita Persson (Sweden), Suzanne Brøgger, Joakim Garff, Sven Rossel, Johan de Mylius, Thomas Bredsdorff (Denmark), Harald Ness, Knut Faldbakken, Kristin Brudevoll, Lars Saabye Christensen, Asbjø Aarseth, Karsten Alnæs, Herbjørg Wassmo, Arne Torp (Norway), Sigurður Magnússon, Ingibjörg Haraldsdóttir, Guðbergur Bergsson, Úlfar Bragason, Már Jónsson (Iceland) and many others, whose lectures and reports, as well as their support to a number of Bulgarian - Nordic scientific and cultural initiatives, have played an important role for the new Scandinavian Studies programme and its future. Frequent guests to the students and lecturers of the Scandinavian Studies programme are the ambassadors of Denmark, Iceland, Norway and Sweden, who show exclusive interest in their work and the problems that occur in the teaching and learning process and do their best to cope with them. We are especially grateful to the Swedish Institute and the Swedish Academy in Stockholm, The Ministry of Foreign Affairs and the NORLA foundation in Oslo, the Danish Cultural Institute and the Danish Literature Centre in Copenhagen, the Icelandic Ministry of Education, Culture and Science, the Sigurður Nordal Institute in Reykjavik, the Finnish Literature Information Centre in Helsinki, universities and libraries in all Nordic countries, the Sverigekontakt union in Gothenburg, etc. It is not surprising that HM King Carl XVI Gustaf and HM Queen Silvia of Sweden visited the students and lecturers of the Scandinavian Studies programme, who had arranged a large exhibition on the Bulgarian - Swedish contacts through the centuries to honour their presence. 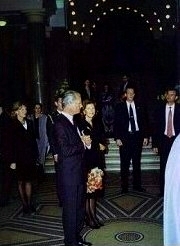 People of high standing and government officials from the Nordic countries often pay visits as well. Under the aeges of the Swedish embassy and the Swedish Institute and thanks to the financial support of the Danish, Finnish and Norwegian embassies the Northern Star lecture hall was renovated and equipped in October 2004. The project was sponsored by a number of Scandinavian and Bulgarian companies. Since 2011,a Swedex Test Centre is affiliated with the programme and organises examinations for proficiency in the Swedish language in accordance with the Common European Framework of Reference for Languages. 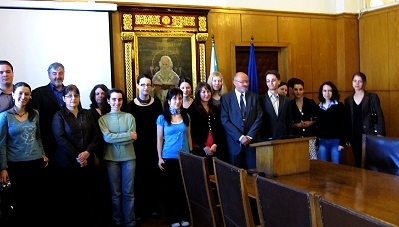 The Scandinavian Studies programme maintains lively contacts with the Ministry of Education and Science, the Institute for literature at the Bulgarian Academy of Sciences, the National Library "St. Cyril and St. Methodius", the National Literature Museum, the University in Blagoevgrad, as well as with many other scientific and cultural institutions, whose representatives regularly take part in the conferences and exhibitions arranged by the Scandinavian Studies programme. Thanks to the united efforts of the Bulgarian specialists in Scandinavian studies and the magazine "Panorama", published by the Bulgarian Translators Union, three issues of the magazine, devoted respectively to the Danish, Swedish and Norwegian contemporary literature, have come out. Central drama theatres as The National Theatre, the Youth Theatre, the Theatre “Sofia” and the “Bulgarian Army” Theatre have staged plays by August Strindberg, Henrik Ibsen, P.O.Enquist , Lars Noren and Stig Dalager thanks to the translations made by the lecturers and students at the Scandinavian Studies programme. Books by Scandinavian authors are also regularly translated.